Our Miniature Art show is a show for everyone to make Art and Buy Art. 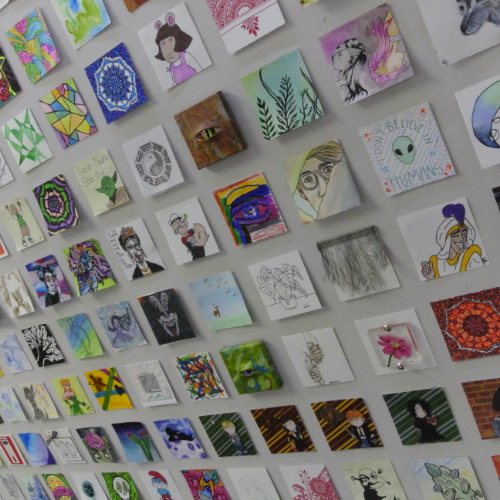 We have 100 participants making over 1000 3" x 3" Artworks. This show benefits Artists and PAWS pet pantry The preview party is a kickoff to this two month show. Tickets give you the first chance to buy the Miniature Artwork! All Artwork is sold for $5, making it easy and affordable to start an Art collection! The Miniature Art show is a show held March and April 2019 bringing Art to Everyone with low cost Art from area Artists. All Art is sold for just $5! This year we are raising money for PAWS pet pantry with a portion of every sale going to them! The preview party is the kickoff event. Tickets to the preview party entitles you to the party from 6-9pm. During the party we will provide snacks and drinks. You will get the first opportunity to purchase Art from the show. Many of these Artists sell their original works for hundreds of dollars! All Artwork will be sold for $5! This show is a great way to see tons of amazing Art and get to take some home with you!